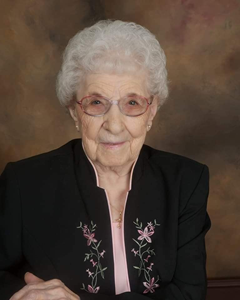 Cecil Fern Cook, 103, of Topeka, Kansas passed away peacefully at McCrite’s Plaza on April 10, 2019 with her daughters by her side. She was born on June 4, 1915 to Stella Mae Owen & William Meyer of Ozawkie, Kansas. She and her sister Alberta rode a pony to their 3-room schoolhouse in Ozawkie. She attended Ozawkie High School graduating in 1933. Cecil was the “running center” on the girls’ basketball team. While she was in high school she met her future husband Sam Cook, when they went on a double blind date and ended up swapping partners midway through the date. Cecil and Sam were married on November 3, 1934 and welcomed their first daughter, Darlene, in 1936 and second daughter, Janice, in 1940. They moved to Topeka in 1936 to raise their family. Cecil was a homemaker until her daughters went to junior high and then went to work at Josten’s American Yearbook, where she was a team leader until her retirement in 1977. Sam and Cecil traveled with their 5th wheel trailer for several years after retirement until 1979 when they became great-grandparents. They provided daycare for their great-grandchildren until they were ready for preschool and during summers until they could stay on their own. They said that those were the best years of their lives, watching and participating in raising their grandchildren and great-grandchildren as they grew up. Cecil and Sam were true hands-on partners caring for and loving children. Cecil lost the love of her life in 1994 after 60 years of marriage. She was a devoted Christian and a member of Otterbein United Methodist Church and later Northland Christian Church, both of Topeka. She was also a member of Oakland Rebecca Lodge 616 for over 60 years and the Topeka Good Sam Camping Club. She had a servant’s heart and loved helping others anyway she could. Some of her favorite past times included gardening, sewing, mending, needlework, quilting, weaving lawn chairs, potholders and sharing her works with family and friends. Cecil is preceded in death by her husband, Sam Cook; parents, Stella and William Meyer; sister and brother-in-law, Alberta and Howard Bates; and son-in-law, Joe McCarter. She is survived by her two daughters, Darlene McCarter, Topeka; Janice Carr (Darrel), Rossville; grandchildren, Susan Cochran, Becky Centlivre, Brad Foster (Linda), Brent Foster and Renee Foster, 18 great-grandchildren, and 24 great-great-grandchildren. Cecil will lie in state from 1:00 p.m. until 3:00 p.m. on Sunday, April 14, 2019 at Penwell-Gabel Mid-Town Chapel, 1321 SW 10th Ave., Topeka. A celebration of Cecil’s life will be 2:00 p.m. Monday, April 15, 2019 at Northland Christian Church. The family will greet friends beginning at 12:30 p.m. until the start of the service. Interment will be held directly after the service at Memorial Park Cemetery, 3616 SW 6th Avenue, Topeka, Kansas. Memorial contributions may be made to the The Capper Foundation, 3500 SW 10th Avenue, Topeka, Kansas 66604 or Northland Christian Church, 3102 NW Topeka Blvd., Topeka, Kansas 66617. To leave a message online for Cecil’s family, please click the "Share Memories" button above. Add your memories to the guest book of Cecil Cook. For many years Cecil had an apartment across from my late sister Betty. They became true friends and as close as sisters. Recently, we enjoyed our phone conversations with Cecil. She was as fine of a person as you will ever know.